There are some thoughts you cannot escape from thinking; there are some emotions you cannot avoid feeling. Sometimes, it takes engulfing oneself fully in darkness in order to overcome it. 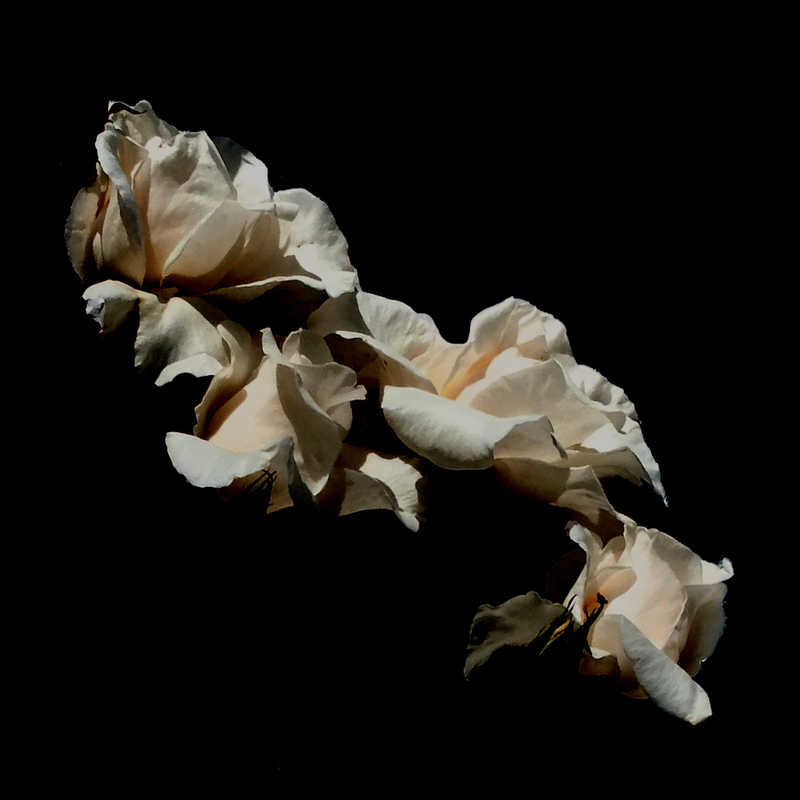 NRVS LVRS’ (pronounced “Nervous Lovers“) sophomore album, Electric Dread, is a vessel of anxiety and fear, an aural manifestation of melancholic doom and gloom that allows for the cathartic expression of our deepest, most visceral psychosomatic experiences. Powerful, overwhelming and incredibly entrancing, Electric Dread is the journey through fire you’ve been waiting for. Atwood Magazine is proud to be premiering Electric Dread, NRVS LVRS’ impassioned and emotionally-driven sophomore album (independently out 6/30/2017). 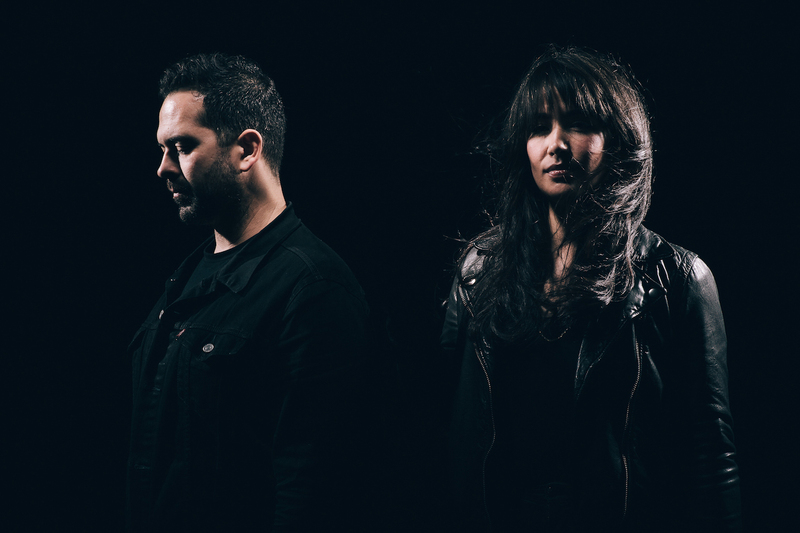 The San Francisco-based darkwave project of husband & wife duo Andrew Gomez and Bevin Fernandez, NRVS LVRS’ 2015 debut album The Golden West (Breakup Records) teetered a many-sided line between pop, shoegaze, synth-wave and more. Their sophomore effort is a cohesive expansion that peers into the depths of the cold, the dreary, and the impenetrable: Darkness permeates from all sides of Electric Dread as NRVS LVRS establish a uniquely full-bodied signature that threatens to drown the listener in sonic fury. Gone are the pop elements that scattered bits of light into NRVS LVRS’ debut: Electric Dread finds strength in the shadows. “I had come up with the name after experiencing a bout of panic attacks a couple of years ago,” explains Andrew Gomez. “The way I felt them was first through a shock of alarm out of nowhere that soon gave way to a feeling of drowning in overwhelming fear and anxiety to the point where once I went to urgent care to make sure I was physically okay. For me, “electric dread” seemed to cover that complex mix of feelings adequately.” NRVS LVRS instantly stand out in submitting themselves to such extremes, avoiding the ordinary and defying tradition in the best possible way. At nearly an hour in length, Electric Dread offers a unique escape from reality’s shackles. Gomez explains how album opener “Primer Impacto” “was written by wanting to put the listener into an open and spacious place before burying them in an avalanche of sound. Next, “I Am Almost Perfectly Awake,” which introduces vocals to the record, has a nervous but danceable energy, and carries on the sonic density we like to play with. Sequencing them one-two seemed like a good way to set the tone and feel for the rest of the record.” We hastily put our seatbelts on in “Primer Impacto” before being thrown into the thickets. “I Am Almost Perfectly Awake” hypnotizes with syncopation between a forceful synth and driving drums, a dreamy soundscape that serves as an ideal backdrop for Bevin Fernandez’s intoxicating lilt. Her voice dances upon the dark, chilling waves, inviting us to join NRVS LVRS and thrive within life’s instability. The single dives into a mesmerizing saxophone solo (courtesy of Bruce Withycombe) as it comes to a close, a fitting end to a perfect album introduction. “I Am Almost Perfectly Awake” is inspired by Clive Wearing, a musicologist who suffers from severe amnesia and experiences life anew from moment to moment – “as if he is waking from a coma every twenty seconds,” explains the band. “The title was taken from a line he repeatedly wrote in his diary, and we kept coming back to the phrase and how searching & sad it sounded. Trying to imagine living life with no memories had us trying to unpack so many different thoughts: how our identities are tied to our memory, how scary it must be to wake up not knowing who or where you are hundreds of times a day, and how the loss of a memory is a kind of death.” Both Gomez and Fernandez embedded their own experiences of loss, death, and pain throughout Electric Dread, which as a whole might be thought of as a vessel for the grieving process. Yet dark themes do not directly translate into misery: Instead, many of the tracks on Electric Dread find ways of mixing human warmth and vital energy amongst the sorrow. “Neon Black” picks up the pace with glittering synths and an enchanting back-and-forth between husband and wife; their shared spotlight is a reminder of NRVS LVRS’ intrinsic intimacy. The constant in our music is probably our love of weird keyboard sounds. I’ll always love guitars, but the inspiration for songs for me almost always has its roots in a new synth sound. Electric Dread comes to a peak on single “Castling,” the end of side one and NRVS LVRS’ favorite track on the record. A true flirtation with the abyss, “Castling” faithfully captures the NRVS LVRS essence, combining their record’s many hypnotizing and dreamy elements in a single, vividly evocative performance. Like much of Electric Dread, “Castling” derives inspiration from another reading – in this case, Murakami – and finds the band waxing their own intense emotions through an intricate balance of billowing music and flowing lyrics. But let us not spoil all the fun. There is a lot to love about Electric Dread: NRVS LVRS’ coming-of-age album provides catharsis through a glistening haze that will ultimately swallow us whole before spitting us out. Yet what we discover, as we return to our familiar world, is how much we can learn from the darkness. One does not dwell in pain and terror on purpose – but as was earlier stated, sometimes it takes fully engulfing oneself in order to persevere. With that in mind, NRVS LVRS’ Electric Dread can be a vehicle for physical, emotional, and psychological release. Dig deeper into the band and their new music through our interview below, and envelop yourself in Electric Dread through Atwood Magazine’s exclusive album stream! The album title paints a picture, and the music allows that image to go even deeper: Who are NRVS LVRS on your second album? Bevin: We are much more focused and sure of who we are as an act and what we want to be. We shared a very clear mental picture of how we wanted the whole album to come across. What inspired the name of the album? Andrew: I had come up with the name after experiencing a bout of panic attacks a couple of years ago. The way I felt them was first through a shock of alarm out of nowhere that soon gave way to a feeling of drowning in overwhelming fear and anxiety to the point where once I went to urgent care to make sure I was physically okay. For me, “electric dread” seemed to cover that complex mix of feelings adequately. Bevin: Despite us naming the record in 2015, I feel like the title ended up being prescient with what is happening in the political and social landscape of the country. Many of us have been feeling an overwhelming sense of dread for what is to come since November. This record opens up into this dark, billowing cacophony of sound. What was the intent behind the first two tracks? Andrew: The first song “Primer Impacto” was written by wanting to put the listener into an open and spacious place before burying them in an avalanche of sound. Next, “I Am Almost Perfectly Awake”, which introduces vocals to the record, has a nervous but danceable energy, and carries on the sonic density we like to play with. Sequencing them one-two seemed like a good way to set the tone and feel for the rest of the record. The juxtaposition between your vocals is evident immediately as a key feature of your music. How have you developed your sound over the past few years, and what about it remains constant? Bevin: Personally, I have felt more confidence and assuredness in the songwriting and recording process since the first record. I had a clearer idea of what I wanted to sing and wanted to push the vocal melodies into stranger and more interesting places. Andrew: Our first record was a collection of songs that went back almost ten years in some cases, and each one was musically disparate from the next. The tracks on “Electric Dread” were written within the span of about a year, and we had about 20 of them that were finished or close to it, so we could pick and choose what sounded the best together as a cohesive album. The constant in our music is probably our love of weird keyboard sounds. I’ll always love guitars, but the inspiration for songs for me almost always has its roots in a new synth sound. You focus heavily on building aural mountains of sound - a movement that results in huge emotional ups and downs. What is it about this approach that appeals to you? Andrew: It’s very flattering to have you phrase it that way. I love playing with the density of a song’s arrangement. It’s fun when your expectations are initially set by a minimalist approach and then along comes a wave of sound to immediately change the color of the world around you. Can you speak about your writing process? What themes do you find most attractive, and did you find any larger motifs as the record came together? Bevin: Usually Andrew comes up with the first spark of an idea for the music, and then we collaborate on the arrangement, instrumentation, and lyrics together. As for themes, we are often inspired by a news article or a book we’ve read, and then we try to inhabit a character’s point of view within the story through the lens of our own experiences. Having said that, we tend to write about the darker aspects of life, and in this record we touched on grief and how we process it, and we’d say that’s probably the thread that weaves through every song. Similarly, how did you decide the track listing? It's of particular import, I feel, to this collection. Bevin: We agree and feel it’s vital to all of our favorite albums. We knew that we wanted to open the album with “Primer Impacto” and create two arcs for the first and then the second side. Some of the songs are more emotionally draining than others, so we wanted to try and balance them in a way where there would be some relief after the darkest moments. We then threw it around to everyone who worked on the record & other trusted sources to get their opinions and received some great feedback. Andrew: Over a few drinks we sat around with the band members we’ve been working with for over three years now (Aaron Hazen – drums, Ryan McGee – guitar, Clayton Vorheis – bass) and listened to the tracks in a few different orders. Ryan insisted that “I Am Almost Perfectly Awake” should be the second song and from there the songs seemed to all slide into the right place. Lastly, our pal Ben Schauland at Big BLDG RCRDS suggested some slight changes that we all agreed made it better, so it was a real team effort. I'm nervous to make a definitive statement, but much of me feels like “Castling” captures the NRVS LVRS essence. Can you share more about this song, and why you have it ending side one of your album? Andrew: I totally agree that it’s our flagship song, and it’s our favorite on the record. From the very first spark, we were both really excited about working on it. Having it end side one was an easy decision. When you end a record side, you’ve got the last song you heard still rattling around in your brain as you flip it over, and if we had to have one song from our album live inside people’s heads, this would be it. Bevin: Yes, “Castling” is a very special song for us. You’re spot on! To share the lyrical inspiration, we were reading Haruki Murakami’s “The Wind-Up Bird Chronicle” when we were working on it, and I was completely in love with his writing style. I was immediately immersed in the surreal & dreamlike world he created and wanted the lyrics, vocals, and music to mirror that. What about “Sparrow and the Sea” inspired you to close with this song? Andrew: Just as we knew we wanted to open the album with “Primer Impacto”, we always knew we were going to close the album with “Sparrow & The Sea”. The first half of the song captures the overarching theme of the record (grief, dread, & loss) in the most straightforward way. I had been reading about how a surprising amount of birds are blown out to sea and die from exhaustion, and it just seemed like the perfect metaphor for the futility of fighting against something as huge and all-encompassing as grief. Musically, it made sense as the song instrumentally breaks down and grinds to a halt, so it became the no-brainer way to close the album. If you could choose one sonic“effect” as your favorite, which would it be? Andrew: Two years ago, I got an Eventide Pitchfactor, and everything I put through it inspired me. From the synth line of “Castling” to the guitar melody of “Lost To The Max” to some of the keyboard sounds on “Erased”, it always seemed to be the ace in the hole to provide some immediate inspiration. Between the two of you, do you have any personal favorite moments across this album? Andrew: I really loved what Bruce Withycombe, the saxophonist we had come into Jackpot! Recording Studio on one of the last days we recorded there, brought to the songs he appeared on. From the solo in “I Am Almost Perfectly Awake” to the outro of “Sparrow & The Sea” and everything in between, hearing that baritone sax bubble up out of the rest of the music never gets old to me. Bevin: We were spending the weekend at a pool house in Sonoma in September 2015 and brought basic recording equipment to throw some vocal ideas down for our demos. It was late night, we were having some wine, and just having fun with the process. I came up with the vocal melodies for “Castling” and “I Am Almost Perfectly Awake” in this short burst of time, and it just felt like this magical moment where our songwriting was entering a new phase. With the album out at 2017's literal halfway marker, what are NRVS LVRS' plans for the second half of the year? Bevin: We plan on touring quite a bit. Besides our upcoming record release show, we will be working on a national tour in September and a European tour in October. But before that, we’ll be fleshing out the ideas we have for our 3rd record in July & August. So, we are keeping ourselves busy! 20172017 new musicAlbum Premierealbum reviewAtwood MagazineCastlingDarkwaveErasedExclusive PremiereI Am Almost Perfectly AwakeI Don't Know AnyoneIndependent MusicIndie PopJune 2017Lost To The MaxMitch MoskMusicNeon BlackNew MusicNRVS LVRSNRVS LVRS bandNRVS LVRS CastlingNRVS LVRS Castling reviewNRVS LVRS Castling songNRVS LVRS Castling streamNRVS LVRS Electric DreadNRVS LVRS Electric Dread EP PremiereNRVS LVRS Electric Dread musicNRVS LVRS Electric Dread premiereNRVS LVRS Electric Dread reviewNRVS LVRS Electric Dread songNRVS LVRS ErasedNRVS LVRS Erased reviewNRVS LVRS Erased songNRVS LVRS Erased streamNRVS LVRS I Am Almost Perfectly AwakeNRVS LVRS I Am Almost Perfectly Awake reviewNRVS LVRS I Am Almost Perfectly Awake songNRVS LVRS I Am Almost Perfectly Awake streamNRVS LVRS I Don't Know AnyoneNRVS LVRS I Don't Know Anyone reviewNRVS LVRS I Don't Know Anyone songNRVS LVRS I Don't Know Anyone streamNRVS LVRS Lost To The MaxNRVS LVRS Lost To The Max reviewNRVS LVRS Lost To The Max songNRVS LVRS Lost To The Max streamNRVS LVRS musicNRVS LVRS Neon BlackNRVS LVRS Neon Black reviewNRVS LVRS Neon Black songNRVS LVRS Neon Black streamNRVS LVRS Primer ImpactoNRVS LVRS Primer Impacto reviewNRVS LVRS Primer Impacto songNRVS LVRS Primer Impacto streamNRVS LVRS Rich ManNRVS LVRS Rich Man reviewNRVS LVRS Rich Man songNRVS LVRS Rich Man streamNRVS LVRS SilhouettesNRVS LVRS Silhouettes reviewNRVS LVRS Silhouettes songNRVS LVRS Silhouettes streamNRVS LVRS Silver SpoonsNRVS LVRS Silver Spoons reviewNRVS LVRS Silver Spoons songNRVS LVRS Silver Spoons streamNRVS LVRS Sparrow & The SeaNRVS LVRS Sparrow & The Sea reviewNRVS LVRS Sparrow & The Sea songNRVS LVRS Sparrow & The Sea streamNRVS LVRS Voyeurs!NRVS LVRS Voyeurs! reviewNRVS LVRS Voyeurs! songNRVS LVRS Voyeurs! streamPremierePrimer ImpactoreviewRich ManSan FranciscoSan Francisco indie bandsSan Francisco indie musicSan Francisco indie popSan Francisco indie sceneSilhouettesSilver SpoonsSparrow & The SeaVoyeurs!